So, in honour of Valentine's Day, I wanted to talk about a couple of equine-type items I have picked up over the last couple of months that I really love. I don't know about any of you, but I have always loved "cowboy couture" - the belts, the bling, the boots... THE BOOTS. I have always admired the Ariat Fat Baby and Pro Baby collections, but guess what? GIANT FEET. I often do browse, though - even if I a) can't afford copious prices and b) can't find anything that fits me, so when I found these on Sierra Trading Post, I got pretty excited. The whole kit-n-kaboodle cost me less than $100, shipping included! If you search around, you can find coupons for STP - and you get an extra percentage off for your first purchase. These are the Twisted X Top Hand Bomber boots. 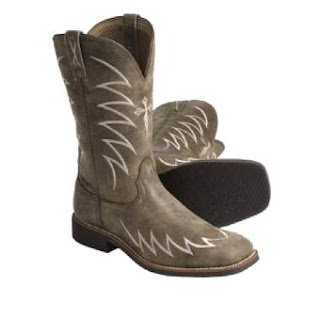 So... they're a men's boot, and they don't have pink... or rhinestones. BUT they fit! The shafts are pretty long and there is ample space for my calf. The best part of all? They are SO COMFORTABLE. I can't even explain. The day after they came in the mail, I wore them all day at a trade fair, on concrete, and had minimal pain (compared to what I normally have at one of these trade fairs, on your feet all day!). Plus, they look so darn snazzy! I am in love with them and even wear them to work on occasion. I could see myself using these boots as a riding or work boot in the barn, definitely. The other purchase I snagged last month which I also really like was a pair of Wrangler Aura jeans - these are advertised as "instantly slimming" (I swear, riding jean companies talk about lycra blend denim like it is a BRAND NEW THING but those of us who wear 16-18+ have known for years how much more comfortable jeans with a little bit of stretch woven into the fabric are!) - aka they have a slightly higher waist and nice stretch to them. I got mine off a sale table, but they were the "average" height. I should have known better and gotten the talls, but they weren't on sale and these aren't a real flare leg like some jeans, so if you lose some length on them, it doesn't look as bad since they come in tight to the boot either way. But also... 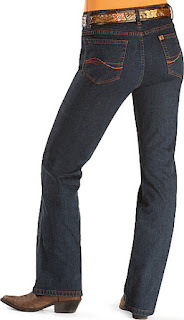 VERY COMFORTABLE - love the stretch and Shepler's has them on sale up to size 22 for $38.99 -- LAST DAY! My Friday Favourite this week was a no brainer after hearing the news about Whizzards Baby Doll ("Roxy"). One of those unfair and inconcievable losses of life in the equine world, a lot like Hickstead! I was very saddened to hear the news of her passing, and even more heartbreaking that they were unable to save his foal. You can keep your horse wrapped in bubble wrap, watch it 24/7 and sometimes, things just happen. They aren't a part of your control, and they aren't preventable, they just happen. I am a little peeved that I can't locate the photographic proof at the moment, but I was blessed to be able to see Stacy, Jesse and Roxy perform at a horse fair several years ago. They did a completely charming bridleless reining duet (is it called a duet?) to "Anything You Can Do I Can Do Better". It was so clearly evident that Stacy cared about that horse and was doing something she loved with her! Every once in a while, I pull out the "famous" video and take a look at the viral sensation that amazed horsepeople and non horsepeople alike, and it still brings tears to my eyes and goosebumps to my flesh to watch! Enjoy. I went home to the farm this past weekend. I've had a real bug to ride Bronwyn since I started riding the Friesian mare (I should give her name, for reference - it's pronounced Lola... but I am not sure that this is how it's spelt. I will get back to you on this one!). 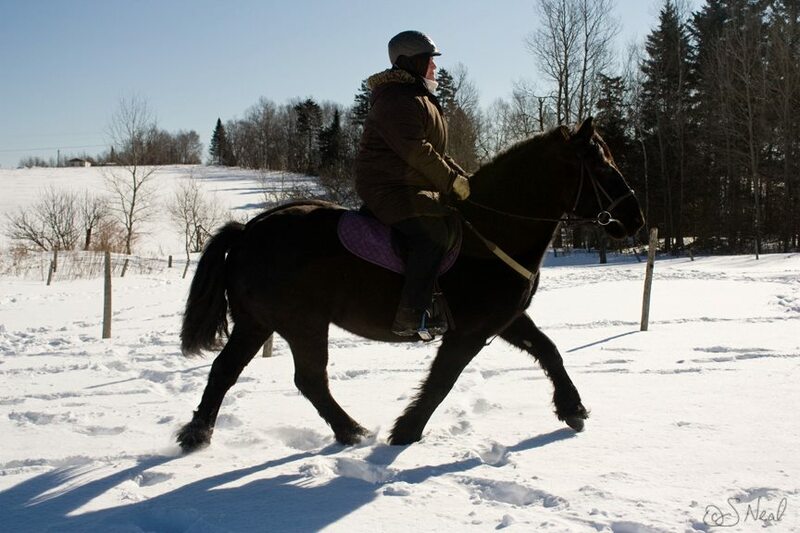 It's not always an easy ride at the farm - we don't really have an outdoor riding area to speak of, and hello, it is winter in New Brunswick. Granted, it is a much more tame winter than we are accustomed to, so far, but it it still winter, and I am still a freeze baby. Before I could ride, there was some general housekeeping that needed done around the farm. We had to build a new box stall (for the long overdue weaning process for Serenity, which she dealt with fantastically, if I do say so myself! ), clean some stalls, put some new plywood on the side of the barn. I spent more or less the whole of Saturday in the barn with my dad. You've seen me mention him here before - but when I am with my dad, I do some of my best thinking - because he's a good listener. I will admit to talking far too much, mostly a stream of consciousness type of conversation - but he listens, and I usually come to my own conclusions (admittedly, sometimes with a little prodding from him). But overall, my strong thought for the day was this: The things that are the most worth having often take the most work. For example, my dog. Being a dog owner in the city is a lot harder than I recall it being in the country. There is no place to put him out unleashed, so he needs to be taken to stretch his legs at least twice a day, with other various outs to do his business (though admittedly, I have created a monster who doesn't want to do his business in his own yard, so his walks are classified as either a "walk" or a "potty walk" - to the end of the street so he is sufficiently distanced from his own property to do his business). I try to spend more time at home because he is there and I like to spend time with him. I am one of those people who finds real joy in the companionship of animals. Morrie provides a great deal of entertainment and emotional support, if I'm honest, to me. So it does require me to get out of bed 20-40 minutes early so there's time for a walk before I go to work - and trust me, I love my sleep - but the joy of having the dog with me, that's worth the inconvenience. Fixing fence, working on the barn, cleaning stalls - those are all things that get "in the way", interrupting our chance to spend time with our horses one on one. But if we didn't have to do any of that work, would it still be as precious, the time that we do have? Would we appreciate it as much as we do now? I have learned over time, that sometimes the most valuable, cherished, beautiful, important things in our lives are those things that you have to work hard to get, you are inconvenienced to maintain, and require the most time and attention. And that's not half bad, I don't think. It helps us to appreciate things more! Where has this lesson been applied in your life? Do you sometimes complain about the work involved with the horses, but appreciate the time you spend with them that much more? Am I completely out to lunch? When everything got cleared up, and all the work (and then some) that we needed to get done was finished, I got to ride on Sunday morning. 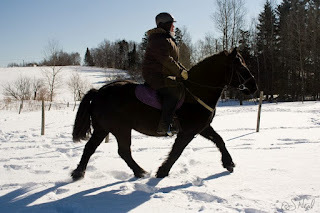 It was a brisk -17C with windchill, the snow was deep, but I bundled up and my horse was joyful as we took a little jaunt through the snow! We are both in "winter shape" at the moment, but we enjoyed one another's company, that is for sure. Make sure you turn up your volume! You got it, I went for another lesson. I have always admired this breed from afar (you all know my love of war horses! ), but never got a chance to get up close and personal with one until the last couple of weeks. I love this mare's quirky personality and the fact that she is well-trained but you don't get what you're asking for unless you deserve it. It's going to be a slow and steady process but I think eventually I will be able to get MY body working together well enough to help Bronwyn get HER body together. I am really excited to be able to speak candidly about being a plus sized rider and have an instructor who is aware of my body's abilities and limitations and helps me to figure it out. I am thankful for that today, for sure! :) Hope you all have a good weekend!